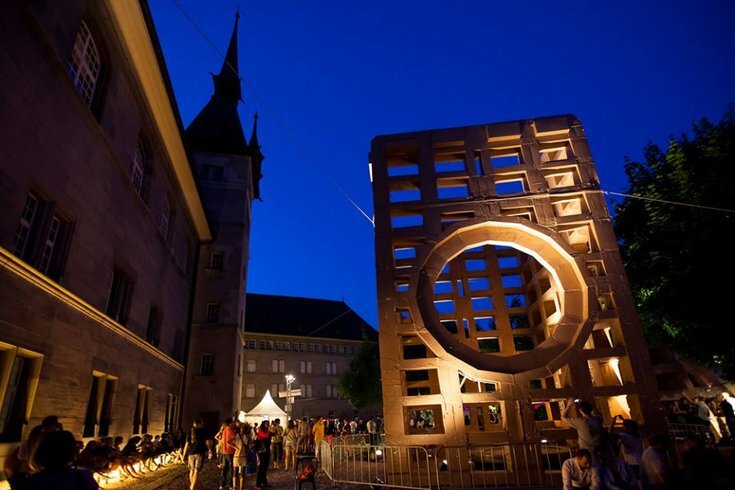 A cardboard structure designed by French artist Olivier Grossetête in Switzerland. For years, French visual artist Olivier Grossetête has called on locals from places like Geneva, Paris, Montreal and Sydney to help recreate globally recognized monuments using nothing but cardboard boxes and masking tape. Later this week, as part of the PIFA Preview Celebration, Grossetête will do the same thing in Philadelphia, creating an 88-foot imitation of Independence Hall titled "The People's Tower" in Dilworth Park. According to the Kimmel Center, this Saturday, there will be no less than 1,400 cardboard boxes and 18 miles of masking tape at the park to create the structure. Attendance is free, but you will be put to work, and you’re free to come and go as you please throughout the day. Making the tower is expected to take up to eight hours and begins at 9 a.m. If you’re curious what Saturday will be like, this video shows Grossetête (and his volunteers) at work building a floating bridge structure in Bordeaux in 2015. Disclaimer: The video is entirely in French, but you’ll get the idea. What makes the event particularly unique is that volunteers are invited to return the next day, June 4, to destroy the piece. The toppling of the tower is especially exciting for anyone who has ever wanted to touch those shining, velvet-roped sculptures at museums (or who has drunkenly succeeded during Art after 5). Release your inner angst with a sculpture you may finally touch, jump on, trample and destroy. From now until Saturday, Grossetête will be holding three-hour workshops twice daily to construct the boxes. Read more about your weekend catharsis here.